Today is National Pick Strawberries Day, so I was on the lookout for a recipe that incorporated both strawberries and BACON! 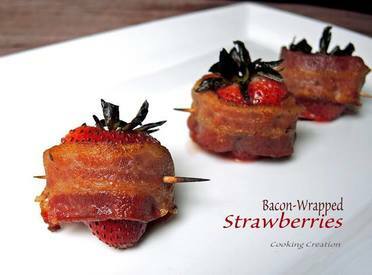 Bacon Wrapped strawberries seems to fit the bill! Reactions will vary but most likely will range from "disgusting!" to "interesting!" to "are you kidding me?! "; either way, these Bacon wrapped strawberries are definitely something that you should try. Imagine salty, crispy Bacon paired with a sweet, delicate strawberry. Hard to imagine? I would challenge you to open your mind and give your taste buds a little ride with this unconventional approach to strawberries. I dare you. You might be pleasantly surprised - just as I was.